Happy Bloggers Challenge Friday! This week I gave the Bloggers Challenge players a Color Challenge of Brown, Green and Blue. When I sat down to create I was a bit stumped as what to create, don't you hate when that happens. 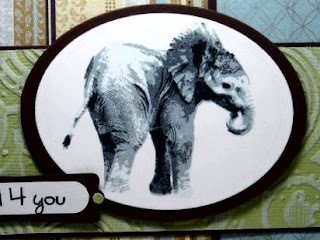 To jump start my creativity, I turned to SCS Sketch 298, it has lots of layers, next I pulled out my Multi Step 'Lil Elephant from Kitchen Sink Stamps, as I thought it would go well with the colors, then went in search of the perfect pattern paper. The pattern paper is from the Basic Grey Wisteria Line, the Green panel is embossed with a Texture Fades Folder using Core'dinations card stock and sanded. Doesn't this image make a cute anniversary card? For more inspiration using this weeks colors click the Bloggers Challenge Logo on my sidebar to see what the other players created this week. Great job with the challenge! I also am a bit stumped which is why mine isn't up yet! LOL! Love your striped DSP! Beautiful! Love the design, image and colors! Brilliant, Lisa! Luv what you can do with an efelant GF! Such a beautiful card! gorgeous Lisa...I would never have thought to use this image with these colors! You are sure an inspiration! Gorgeous layout and selection of papers! Love that elephant!! Great card. Yes, I do hate it when I get stumped (good to know it's not just me) but I think you pulled it off. The papers are fabulous and the Elephant looks so real. Fun sentiment too. Who would have thought that you could use beautiful and elephant in the same sentence. But, that is really a beautiful elephant card. Love the anniversary idea. Love the papers you picked-great combination. The image looks fabulous against them! This card is excellent, Lisa. Love your elephant image and the layout is terrific. Beautifully created. Hugs, Gayle. p.s. Love your new photo, gorgeous. Love the papers you used...and this elephant is SO realistic! Very fun. Love that Big Elephant and the stripes. They make a great combination. I love both cards!! Great image and backgrond papers! I love the papers, love the image and how you made this an anniversary card. Where did that come from? I would never have thought of it and think it is also manly! Those KS stamps are amazing! Your card looks fab! I love the elephant stamp- so cool and so realistic! Beautiful card! Fantastic Elephant! Love the papers you used and cute sentiment! Great papers, love the shades of blues and greens. The layout is fun too. And of course those images are so real looking it never stops amazing me. Still haven't broke down and bought one, I am afraid to go to the site, I may spend my mortgage money, lol! LOVE this, Lisa! Fantastic use of this week's colors! A wow card lisa...thanks for the challenge. That elephant image is fabulous--Maria's eye for details always amazes me. Love the image with this color combination. Love this card and the elephant is so great. Love your color combo too!!! Lisa--thansk much for the nice comments about Sasha--she's doing better now. Love the striped paper you used in your fun card. Great elephant! I was able to play after Sasha's tough day. Sorry to be late in leaving comments--welcome to my crazy life!